We all know that content creation is a quintessential marketing model of our era, but it doesn’t make the process any less difficult or time-consuming. Creating quality content week after week can be a discouraging task and you will definitely run out of ideas at some point along the way. The problem can drastically slow down your inbound marketing strategy, but this is where content repurposing steps in to save your day. Reports show that almost 30% of leading marketers systematically reuse and repurpose content. In this post, we will show you 10 content repurposing tips to help you improve the inbound marketing strategy. Let’s begin! The best posts solve real-life issues of your followers. Therefore, you must find evergreen articles that proved to be most productive in terms of audience engagement. It’s a type of content that helps people resolve practical problems, so you can repurpose it to create another successful blog, infographic, or video. Of course, you should not hesitate to ask visitors to engage by liking, commenting, or sharing the new post. Twitter users publish over 500 million tweets every day. This is a huge number that tells us one important thing – it’s practically impossible to keep an eye on all tweets day in, day out. In other words, Twitter can serve you like the best content repurposing platform since you can regularly publish old posts without making your followers annoyed or disturbed. People prefer visual content over purely textual posts, so we strongly encourage you to create interesting infographics. It’s the easiest way to mix visual and textual content, providing your followers with attractive design and practical information simultaneously. Quora is one of the largest and most popular Q/A websites, but it’s not only a place where people learn new things. On the contrary, it’s also a platform where you can answer user inquiries and establish yourself as the key opinion leader in your niche. BestEssays: It’s a content creation agency that can quickly adapt posts for Quora purposes. SuperiorPapers: This is a team of authors who can help you write new posts or repurpose old ones. EssayWritingLab: Another way to do this job is by hiring Essay Writing Lab. Assignment Geek: It’s a team of professional writers with years of experience in content creation and repurposing. College-Paper: If you are looking for authors specialized in academic writing, College Paper is the place to go. Video content gives you tons of repurposing opportunities. A study reveals that 1200% more shares are generated by social videos than text and images combined, so why not exploit it to turn longer articles into compelling video materials? Live videos represent a huge step forward in terms of video marketing. The best thing about it is that you can use older posts and present them in your own words through live video platforms. This type of content is extremely popular and it promises to drive engagement because viewers are eager to ask questions and post comments while the action is still on. If you don’t feel comfortable going live, you can always focus on audio shows as the way to reuse the existing content. Podcasts don’t require too special or expensive equipment, while you can make the topic more interesting by inviting other niche experts to join you and express their own opinions. This format is particularly popular among commuters who want to educate themselves while traveling. This advice seems a little too obvious, but we simply cannot overestimate the importance of social media. Make sure to create a lot of content-related images and keep posting them on Facebook, Instagram, and other platforms because it’s by far the simplest way to raise brand awareness. But you must never use boring stock photos – they are way too generic and ugly! Webinars make a great opportunity to utilize old content by digesting it into a single topic of discussion. As a marketer, you probably have tons of correlated articles that you can compile and cover subjects from a variety of different angles. Needless to say, brand followers will love to see such a thorough repurposing effort. The last suggestion on our list is extremely important for B2B marketers. LinkedIn gathers professionals from all over the world, so don’t miss the chance to share your content on this network and boost professional authority among decision makers and other relevant stakeholders in your niche. Inbound marketing is critical to the success of your marketing strategy in general. It depends mostly on the quality of your content, but sometimes it’s just not possible to keep coming up with fresh and exciting topics week after week. In such circumstances, content repurposing becomes a powerful tool that enables you to create new posts easily while still being able to drive user interest, leads, and conversion. 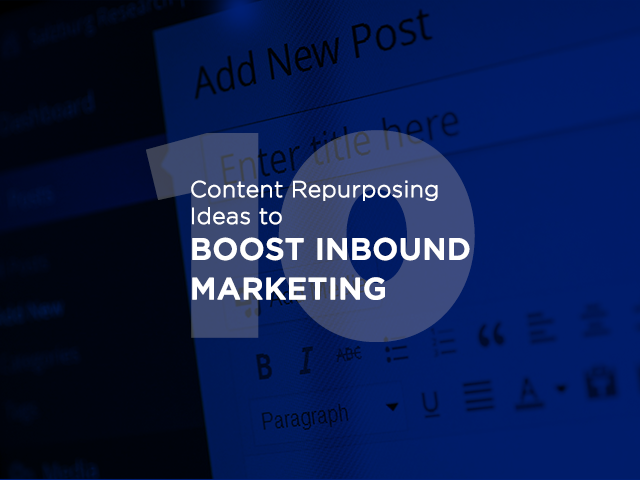 Our post showed you 10 content repurposing tips to help you improve the inbound marketing strategy. Make sure to test these tricks as they can save you a lot of time and efforts, while the results are guaranteed. Eugene is an Australian-based blogger, who is into stand-up comedy. His favorite comedians are Louis CK and George Carlin. A good morning laugh is what keeps Eugene upbeat and motivated through the harsh day.